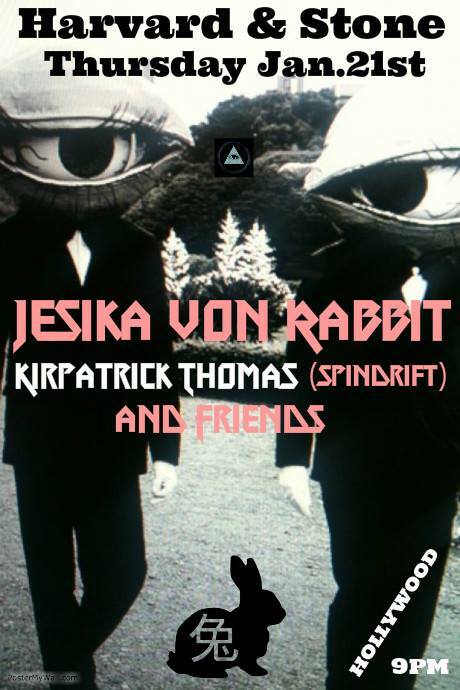 Just added to Jesika von Rabbit‘s January schedule, a show at Harvard & Stone in Hollywood along with Kirpatrick Thomas of Spindrift and special guests. von Rabbit, along with bassist Lee Joseph, and dancers The Grundles will also be performing in San Diego on 1/29 at Soda Bar and on 1/30 opening a sold-out show for Wanda Jackson at Pappy & Harriet’s. von Rabbit and Joseph’s new DJ Tag Team will return to Tryst in Palm Springs on Saturday, Feb. 20 to fill the dance floor with four hours of deep catalog! Calling all inlanders, and hi and low desert dwellers! It`s all happening in Banning on Saturday, Jan. 9 with Jesika von Rabbit, Drug, Jason Nutter, Boss Pilgrim and Ricochet at Boondocks Tavern, 4296 W Ramsey St, Banning, California 92220! And, it`s a FREE show! Get there by 8 PM!